Fantastic Beasts: The Crimes of Grindelwald was my most anticipated film of 2018, especially after the groundwork laid out by its predecessor Fantastic Beasts and Where to Find Them. The Crimes of Grindelwald is the tenth film set in the Wizarding World and is yet another triumph from the mind of J.K.Rowling. Fantastic Beasts: The Crimes of Grindwald fleshes out an already deep, rich, and layered world, answers some of the first films lingering questions, and gives a proper introduction to Johnny Depp’s portrayal of the dark wizard Gellert Grindelwald. Keeping the charm and childlike wonderment of the wizarding world alive, while also going in a darker direction is no easy feat, However, J.K. Rowling balances it perfectly with just enough humor and heartwarming moments to keep, what is essentially a dark and at times bleak film, a bit more lighthearted. At the core of all this darkness and feeling of unease is the Dark Wizard himself Gellert Grindelwald. Grindelwald spends most of the film introducing his ideology, and why his followers should trust and believe in him. He’s utterly captivating, and his best weapon isn’t his wand, it’s his words. He’s a master of manipulation and deception, who can twist any situation so that it suites his vision. This makes him unpredictable, and I would say a more menacing force then Voldemort, and a perfect counterpart to Jude Law’s Dumbledore. Dumbledore is perfectly played by Jude Law. He nails not only the cryptic word choice of Dumbledore but also gets his charm, cheek, and even the arrogance, that was a younger Dumbledore. We know where Dumbledore ends up in the Harry Potter series, but I was just as interested as to how Dumbledore became the man we know in future films, and learn more about his past that was only briefly touched upon before. Crimes of Grindelwald introduces a menagerie of new and interesting characters, and unfortunately, does a poor job in balancing and fleshing out the new crew. Claudia Kim’s Nagini was a cool addition for fans but seemed to have little more purpose than to bridge the Fantastic Beasts world and Harry Potter together. Zoë Kravitz as Leta Lestrange was well written, but there was still more that could have been added so we as an audience could connect a bit more with her. Then we have the return of Ezra Miller’s Credence Barebone. In the first film, he was little more than a scared reserved child, which made sense but here in Crimes of Grindelwald he had little development. Credence is the MacGuffin of this film, so it would be nice to see a bit more to him in the third part of this five-part story, instead of just tears and mumbling. As for the returning cast of Newt (Eddie Redmayne), Tina, Queenie (Katherine Waterston and Alison Sudol respectfully) and Jacob (Dan Folger) they come together to create a unique group that has great chemistry on screen and are the heart and soul of Crimes of Grindelwald. David Yates helms the director chair for his sixth visit to the wizarding world, and once again he brings a certain knowledge and expertise of the world that few others possess. He can bring this world to life as few others can. With the encouraging attitude he brings to the sets of his films, David brings the best out of not only his actors but also in his crew. Which in turn brings Crimes of Grindelwald up a few notches due to the fantastic acting, music, and direction. Fantastic Beasts and Where to Find Them composer James Newton Howard returns for Crimes of Grindelwald, and this time brings and an eerie and unsettling soundtrack that complements every scene and fits every situation. The opening credit song The Thestral Chase perfectly sets the tone for the entire adventure to come. James Newton Howard composed what is one of, if not the best, soundtrack in the entire Wizarding World saga. Fantastic Beasts: The Crimes of Grindelwald may be another setup film, but it’s a setup for an epic story with a well explored main cast, fantastic visuals, a phenomenal soundtrack, and a truly enthralling third act that will make you gasp and leave you speechless. 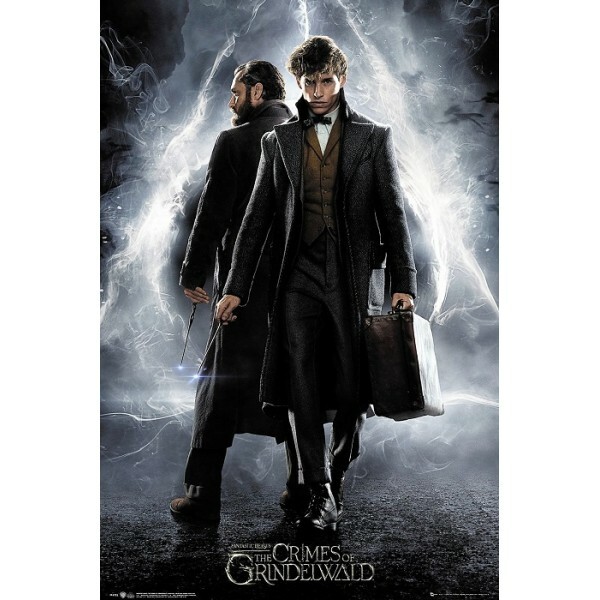 Fantastic Beasts: The Crimes of Grindelwald is one of the best films in the Harry Potter franchise. What keeps it from being the best is a slow and bloated second act, as well as introducing characters but not giving the audience enough information to want to know more about them. Secluded up in the Great White North in his tiny Iglo, Jaydyn has been passionately playing games for over a decade. Throughout the years Jaydyn has accumulated a deep knowledge on the video game industry and is often referred to as "The Harry Potter Encylopedia" This is his first job in the industry.